Who knew that little chocolate elephants prefer their peanuts in butter form? Thanks for clearing that up. We like those crackers. I’ve used them (much cheaper) for chocolate cookie crusts in pies. Those giant bags from Stauffer’s are only $2 compared to buying specialty chocolate wafer cookies. I like the 1 And Done title. Now you know what to bring next time you go to the zoo! I like that pie crust idea!! Chocolate Graham Crackers and PB are one of my favorites. Especially if you can find graham crackers with some sugar chunks on them! The animal crackers are just too small! My vote is for 1 and done as well. Ooh, that reminds me of those blueberry muffins with the sugar chunks on top. Let’s be honest though, the muffin and the chocolate graham crackers are just a means of getting sugar chunks and peanut butter into our mouth. And you’re missing the point – the fact that their small means you can eat so many more! It’s fantastic! No giant peanut butter elephant this time! Maybe next time! You don’t have animal crackers over there? or just the chocolate kind? Everyone feels guilty the first bite, but then your taste buds just mask all that shame and guilt. Wow, what perfect timing! As long as I can help one person get their snack on, my job is complete! Also, cutest photo ever! 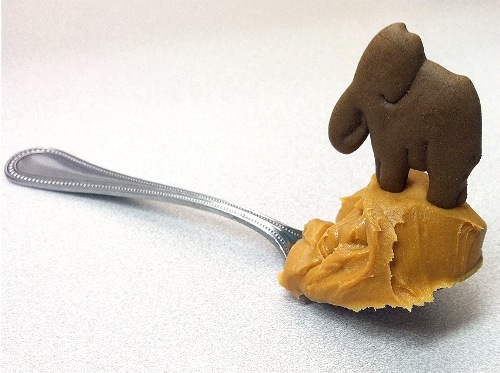 It makes me want to go out and buy cute little animal crackers just so I can play with them on mounds of peanut butter.